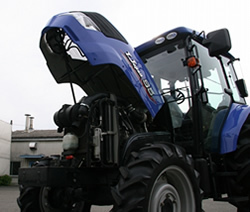 Their high performance, reliability and extraordinary operating comfort make ISEKI tractors the right choice for the professional. 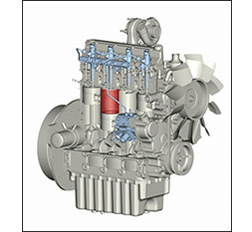 The robust 4-cylinder common rail engine provides its best under heavy load. High displacement and torque at all engine speeds ensures power in reserve whatever the load, giving flexibility and reducing frequent gear changes. The engine runs smoothly and quietly even at low revs but has a low fuel consumption. 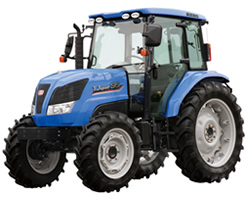 TJV tractors are equipped with evolutional AT Shift as standard. It offers easy and comfortable operation and is not troublesome for operator to work with any implements and conditions. By Throttle Control Shifting, TJV tractors can be driven like a car with automatic transmission. Various transmission speeds enable to work at variable scene. The air-conditioned cabin is mounted on vibration-damping rubber blocks, keeping the cabin noise level around 76db. The ISEKI cabin not only protects operator from the weather, it is also a safety feature. The design is unique. 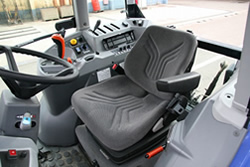 Wide-opening doors provide easy access to the operator's seat. There is plenty of space, everything is in the right spot with all-round visibility. All attached implements are in clear view. 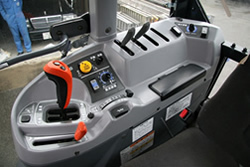 Control levers are located on right side and controls and devices are clearly identified by shape, color and logical groupings. Thanks to full-open engine bonnet with one touch open system, operator can reach engine room easily and quickly for daily maintenance.